Jorge Guajardo spent nearly a decade in Mexico’s diplomatic corps, serving as consul general in Austin, Texas, from 2005 to 2007 before moving to China, where he became one of Mexico’s longest-serving ambassadors to that country, leaving in 2013. Outside of his diplomatic positions, both of which he was appointed to by presidents from the conservative National Action Party, he has worked in Mexican domestic politics, as press secretary and communications director for the Nuevo Leon state governor, also of the PAN, from 1997 to 2000, and in public affairs in the US. He remains active in Mexican politics. 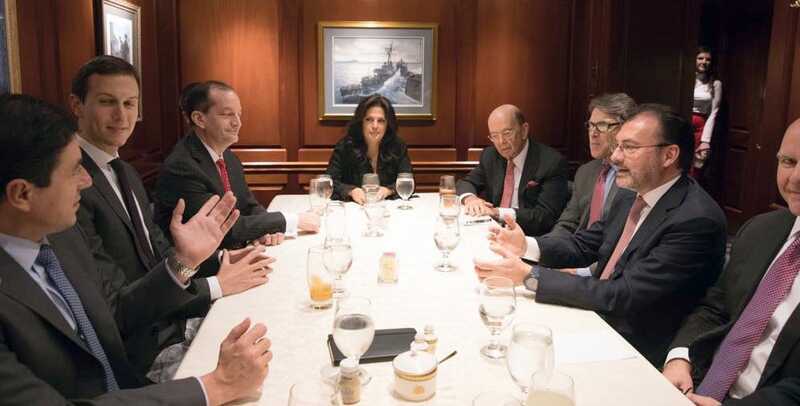 Business Insider sat down with Guajardo in Washington, DC, in mid-March to discuss the first year under President Donald Trump, from his perspectives as both a Mexican and a former diplomat. The conversation below has been edited for length and clarity. Christopher Woody: There was a story back in August, a McClatchy story, it came out just after the transcript of Trump’s phone call with [Mexican President Enrique Peña Nieto] leaked, and apparently the contents of the call were the source of some amusement for the diplomatic community. The conversation in question was within Trump’s first couple weeks in office. We’re now over a year into his term. What’s the mood among diplomats about Donald Trump and about his administration? Jorge Guajardo: I would say it’s less concerning in some areas, inasmuch as people have, I would say the diplomatic community has gotten to understand that they should indeed ignore most of his Twitter as white noise – distractions, if you will. On the other hand there’s uncertainty, and as diplomats you try to do away with the uncertainty and try to find ways of working out. So I think there is still confusion – for instance, you may come as foreign-government envoy or as a diplomat and you engage with your counterparts here, only to have it unravel because the president may tweet in another direction or just undo everything you had worked [for]. So even though there is less uncertainty with regards to everything blowing up in your face, there is still uncertainty into how much your counterparts are actually speaking for the administration, and you see a secretary of state who goes out and says something only to be disavowed by the president, and the same applies to most other areas. So that’s complicated. Woody: How would you assess the Mexican government’s handling of its interactions and relations with the US government? Guajardo: I’m not a big fan of the way they have been handling these things. Now mind you, they have been dealt a difficult card, but … I would highlight two things. Their insistence in bringing the two presidents together. I don’t see what the point is. I think the president of the United States is dead-set on insulting the Mexican president at every opportunity he has. It’s just going to create problems for Mexico if they get together. So I don’t see why they keep insisting on having this. I don’t see what legitimacy they’re aiming for in this summit. On the other hand, they have put all their eggs in Jared Kushner’s basket. I guess because it has worked for them, but I tend to think it’s better to institutionalize the relationship, and if you go through the State Department or the respective institutions, you’re better positioned to withstand any shocks. For instance, if Jared Kushner leaves tomorrow, for whatever reason – or as we used to say, if martians come down and take Jared Kushner away – you’re safe because you have your institutional relationship, and I think the Mexican government has not been very good at keeping the institutional relationship, in order to favour Jared Kushner as a channel. Mexican Foreign MinistryJared Kushner, second from left, and Mexican Foreign Minister Luis Videgaray, second from right, with other Mexican and US officials in Washington, DC, February 14, 2017. Woody: People I’ve spoken to, political scientists, they have said the same thing: If you rely on these personal connections to establish diplomatic relations, you put yourself at the mercy of the longevity of those people in office. Guajardo: Exactly, and that’s a problem. Not only is it a problem for you, as a counterpart to the United States, but for your successor as well. Because whatever the case, Mexico will have a new government come December 1, and it is this current administration’s responsibility to ensure that there is a good transition, a working transition, and when you have done everything through your personal connections with Jared Kushner, well it doesn’t necessarily provide for an institutional transition of power, since the incoming administration may not have that personal relationship with Kushner. If you have done everything institutionally through the respective channels, it will be easier for the incoming administration, of whichever party it may be. Woody: So you’ve spent time in Texas, which is a red state. You work in Washington now. Do you think the Mexican government, Peña Nieto or another administration, do you think there’s a strong knowledge among Mexican officials about how US politics works? Guajardo: I think yes. There is a sense, without a doubt. The one thing, and I would just say … I think most of the world understands the way the United States system works, and you will see that most of the Mexican government has either US educations or speak English, have lived in the United States at some point, have relatives in the United States, so yes, I think in that sense there is a good understanding of how the political system works in the United States. Woody: But in Peña Nieto’s case, they have been dealt a bad hand and they have made a few missteps. Guajardo: Well, how do you deal with a president who’s dead-set intent on insulting you at every at every chance [he] gets because it makes him feel good? What do you do? If it were up to me, I just say, ‘You do your thing. I’m going to do my thing,’ and just try to ignore each other as much as possible and make sure that everything under is working. Why keep insisting on that summit meeting, I don’t know. 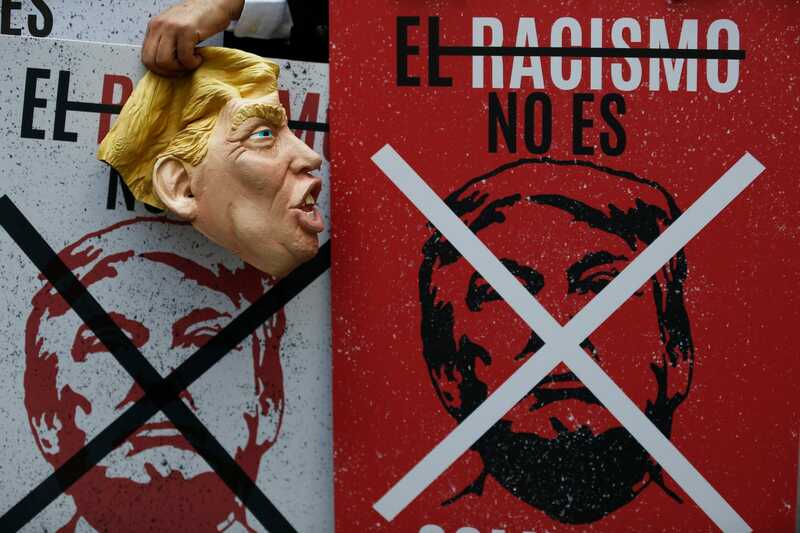 (AP Photo/Marco Ugarte)Activists wearing Donald Trump masks and carrying signs that read, in Spanish, ‘Racism is not commerce,’ protest the seventh round of NAFTA renegotiations, in Mexico City, February 27, 2018. Woody: You referred to Trump’s tweets “white noise,” which is I think an assessment a lot of people would make. But in your position and as someone who lives and thinks as a Mexican and an American and as a diplomat, how do you tell what’s noise and what’s substance coming out of this administration? Guajardo: I think Mexicans have discounted the fact that Trump doesn’t like Mexico or Mexicans, that he dislikes [them] … whether it be for racist reasons or whatever, I think Mexicans have discounted that, and, for instance, you’ll see him go to Pennsylvania and do his rally, make fun of the Mexican president. It barely makes news in Mexico; however, when he talks about imposing tariffs on steel, he does do a carve out for Mexico. So we understand that where the important things lie, he understands what he can and cannot do, and Mexico, personally I think he dislikes Mexico, and, I mean, it’s a shame but we’re OK. We can live with that. I don’t need to be liked by everybody. God knows we don’t like him. So, I mean, that’s what I call white noise. If he just wants to be calling us things, well, we call him many things back in Mexico, so it’s mutual.